Thin sole and too nice to get dirty! I picked up this pair of Five Ten Dirtbag shoes direct from the manufacturer's website on closeout special. This is the low top version in brushed brown suede with white Stealth rubber soles. The soles feature a large dot pattern for grip. When I placed the order, I fully intended to use them for all types of riding and also off the bike. My selection of mountain bike shoes are great for riding... not so great when you are off the bike. This looked like a good for both kind of shoe. They arrived in a timely manner and fit true to the size of other FiveTen shoes that I have owned. I was immediately impressed with the comfort and the shiny white soles have that retro look like vintage skateboard shoes. I began to wear them around town to break them in. They got more comfortable as I broke them in. I immediately liked them a lot! And I continued to use other shoes to ride bikes. After several months, I found myself wearing the shoes while standing next to bikes and needing to go somewhere fast. I discovered that they do indeed work great for pedaling and the grip is better than average - but less grip than the black Stealth rubber. The soles themselves are actually quite thin on the Dirtbags. Plenty of padding for casual walking, but you can feel every bump through them and there is very little stiffness to them. If you are buying them for riding, they are not meant for serious trail rides and are better matched with a session of street riding, dirt jumping or pub crawling. I elected to purchase another Five Ten shoe with thicker soles and a more durable design for flat pedal riding and I strictly use this pair of shoes for pre and post ride activities (with an occasional burst of mad dog pedal sprinting thrown in). After 18 months of casual use, they are holding up well and there aren't any torn seams, premature wear or unexpected damage. Since they are so light, I would only recommend them for riding if your expectation is for a thin soled shoe that fits and feels more like a skate shoe. On the other hand, if you are looking for a sharp looking, multipurpose casual shoe for the trailhead and town, this might be the perfect shoe! 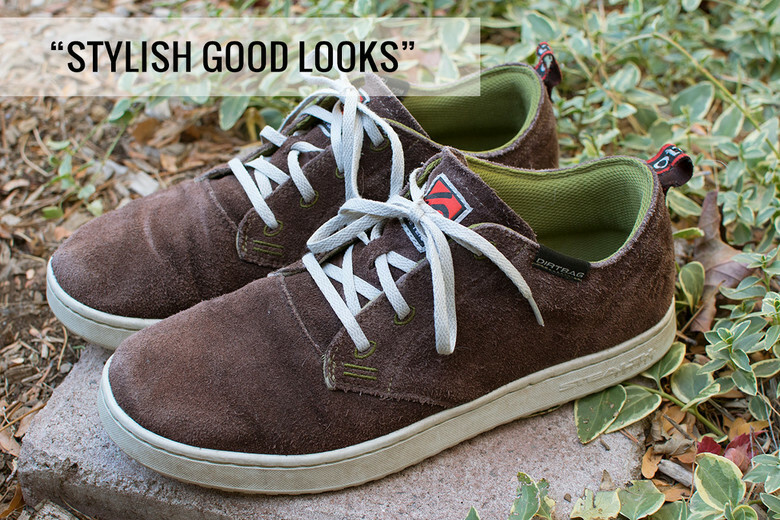 Comfort and support are two of the most important considerations for a functional casual shoe. The Dirtbag's Micro-Dotty outsole utilizes our non-marking Marathon rubber for high durability and a sticky, all-around tread for multisport use. The high-top suede upper is comfortable and provides a greater level of ankle support than our other casual shoes.